Hello! My name is Bernard Sfez and I am full of energy! I build website and manage online projects to successful launch. You need a consultant in content management, Tiki Wiki or WikiSuite. You look for a Fullstack developer or a ready to use integrated solution. You need an analyst-programmer with solving problem abilities. You want an experimented specialist in eCommerce, video and multilingual. My customers enjoy this ! My services are tailored to allow quick deployment with controlled cost as well as custom development and on going maintenance. They are divided in three categories of service: Web Application, Tiki Wiki and Wordpress. The Web Applications I'm distributing are ready-to-use software that can be customised for you to use it right away avoiding big cost of custom made website. You'll enjoy managing powerful application from the palm of your hand as all the applications are Bootstrap 4. Once your app is running it will be possible to improve it and to add features to perform better with your needs and business. Having years of experience using Tiki Wiki I have a very good understanding of the multiple needs of individuals or organisms with this powerful website builder tool. My services covers common task like new install, upgrade or hosting as well as custom development, troubleshooting or complex project design. Tiki Wiki is a future-proof open source software able to complete most tasks and to help you testing it, I offer a free ride ! Enjoy Tiki for one month for free (slot availability). Register to enjoy my Tiki kickstart free month offer. Wordpress is a software you can use to create a blog or a business card website. If you have limited needs and resources to manage your online presence then Wordpress is a very good choice. Select a theme, a domain and you'll have your website online. If you need more at some point it will be always possible to migrate your content to a Tiki Wiki system to enhance your application. Ready to use modules for quick deployment, flexibility and cost control. Wide range of services help setting up or maintaining your Tiki website. Simple and Effective support for your presence on the Internet with Wordpress. Yes you read correctly ! I offer you for free to use and start working on your Tiki website for one month. Just register and I create for you a brand new Tiki on my server with admin credential and access to all my Tiki Express Tutorials. On delivery I give you one hour free of consulting and support to help you during your initial setup. You test, explore and can decide without any kind of obligation. Once the trial period is over you can stay and go on, decide to use Tiki on a different hosting or simply leave, no questions asked. To participate to the Tiki Kickstart trial, fill the following form. The conditions are very simple and you have to approve them to submit this form. I’ll contact you to complete your request and you’ll enjoy a Tiki website for one month free of any charge. The subdomain for your Tiki Website that will be used to reach your website. IE: If you enter "Wikivintage" your Tiki will be accessible using https://wikivintage.bsfez.com. Don’t forget your International country code. If you want to give me any relevant information. The offer includes hosting setup on one of my servers, a Tiki website install and a consulting session up to one hour online. The Tiki Free Trial is made for any individual to test, explore and validate Tiki. There is no warranty of any kind concerning the protection and the restitution of the content, the setup or modification made. The offer duration is 30 days and the total size of the space and the bandwidth is limited to 1gb for one person or organism only. During the validation you may be asked to send me a scan of a valid ID or a credit card to protect myself from misuse. You understand that the Tiki can be disabled at any time and everything deleted. You understand that this service is given as is and I can't and won't be responsible for your using of this free trial in a way or another. I'll keep the right to end any subscription without any warning and at any time. I have a very positive attitude, analytical thinking and out of the box approach when needed. I'm curious and I like to build things and to push my limits. That’s what Bernard Sfez is made of. I'm a hard worker, determined and passionate with enough experience to consider risks and objectives in an evolving market. People like to work with me because I increase the amount of positive vibrations in the work place. I don't consider a problem a bad thing, but an opportunity to improve or enhance. I have strong morals and ethics and I'm someone you can trust. My customers and friends knows I uphold respect and loyalty in life as fundamental values. You want to know more about me ? Entrepreneurial and result-oriented I'm able to manage a project from end to end. Multidisciplinary adept with over 20 years of versatile experience I'm a fast learner and acquire new knowledge everyday. I enjoy serving my customers and acheiving goals working under SCRUM project/software management method. I'm involved in Open-Source & FLOSS projects and an active contributor to the Tiki Wiki CMS Groupware (Consultant and Project Administrator). Real ability to listen and understand customer's needs. Proven focus on getting the work done and things pushed forward. Multilingual solution specialist including right to left and exotic language encoding. Proven ability to manage developer team (local or global). Strong discipline and commitment (Scrum/Agile explicit requirement). Solution designer including architecture, workflow and technical specifications. Experience in Big Data (SQL and NoSQL database) and backup/security patterns. Easy to digest information that caught my attention and I found interesting to publish and explain. 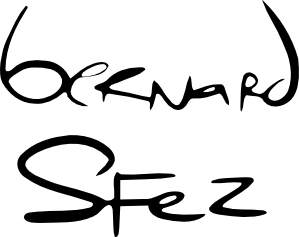 I maintain Bernard Sfez blog and publish content from time to time. I'll explain the Tracker Item list view... And I'll quickly show Diagram, a new feature in Tiki19. Feel free to contact me, Bernard Sfez by email : me at bsfez.com. Your form has been successfully submitted ! This process is manual and I will review your application as soon as possible. It may take sometimes as I’m a busy man, but if after a week you didn't get an answer (positive or negative) let me know and I'll take care of it.